The Great Blue stands 132 cm (four feet) tall, has a 213 cm (seven-foot) wingspan and weighs 2.5 kg. It has a long yellow bill. Adults have blue-grey wings and back and a white head with a black cap and a long black plume. In flight, the long neck is held in an S-shape with the long legs trailing behind. This bird flies with strong deliberate wing beats. 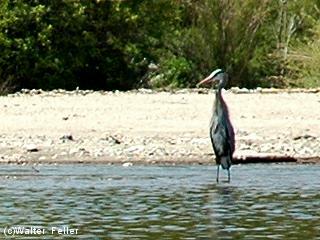 The great blue heron is fairly common all year throughout most of California, in shallow estuaries and fresh and saline emergent wetlands. Less common along riverine and rocky marine shores, in croplands, pastures, and in mountains above foothills. Common July to October in salt ponds where fish are numerous (Cogswell 1977). Locally common near rookeries February to June or July. Few rookeries are found in southern California, but many are scattered throughout northern California; knowledge of their locations is incomplete (Mallette 1972, Belluomini 1978, Garrett and Dunn 1981). Feeding: Nearly 75% of the diet is fish, mostly species not sought by humans (Cogswell 1977); also eats small rodents, amphibians, snakes, lizards, insects, crustaceans, and occasionally small birds. Stands motionless, or walks slowly, when searching for prey in shallow water (less than 30 cm; 12 in) or, less commonly, in open fields. In a pond in Florida, fed mostly in open water rather than among emergent vegetation (Kushlan 1976b). Grasps prey in bill, rarely impaling. Parents regurgitate food for nestlings. Cover: Perches and roosts in secluded tall trees. Also perches on kelp beds offshore. Reproduction: Usually nests in colonies in tops of secluded large snags or live trees, usually among the tallest available; rarely nests on ground, rock ledges, sea cliffs, mats of tules, or shrubs. Colonies should be protected from human disturbances, which often cause nest desertion (Ives 1972, Gould 1974, Jackman and Scott 1975). Water: No additional information found. Pattern: For nesting, prefers secluded groves of tall trees near shallow-water feeding areas, but feeding area may be up to 16 km (10 mi) distant (Krebs 1974). Activity Patterns: Active yearlong, feeding both night and day, but most active around dawn and dusk (Terres 1980). 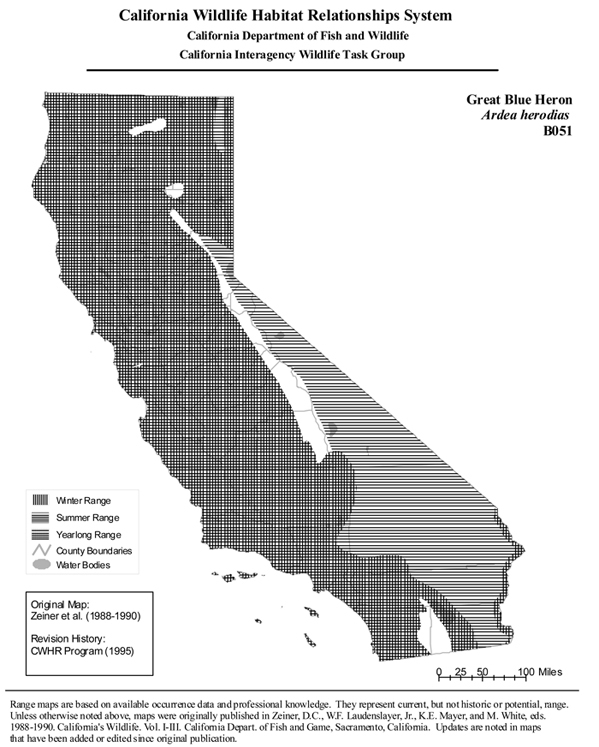 Seasonal Movements/Migration: In June or July, after breeding, disperses from nesting colonies to outlying areas, but there is little regular migration (Gill and Mewaldt 1979); many depart from northeastern California and east of the Sierra Nevada in winter. Home Range: In British Columbia, breeders flew up to 16 km (10 mi) from nest (Krebs 1974). Territory: Breeding territory includes only the nest and immediate surroundings (Cottrille and Cottrille 1958, Mock 1976). Nests in Marin Co. were spread as far apart as sitting birds could reach (Pratt 1970). Feeding territories may be defended (Palmer 1962, Krebs 1974, Kushlan 1976b), particularly in the nonbreeding season. Reproduction: Usually arrives on breeding grounds in February. Courtship and nest-building begin shortly thereafter, and eggs are laid in late February or March. Monogamous, and usually nests in colonies, sometimes with 5 or more pairs, but often fewer; and occasionally nests solitarily. Clutch size 1-8, but usually 3-4. Single brooded. Incubation lasts about 28 days. Semi-altricial, downy young are cared for by both parents. Young may fly by 7 wk, but still return to the nest for 2-3 wk, and may be fed by parents until 11 wk old (Pratt 1970). In Marin and Humboldt cos., most fledglings left nests in June and July, but some left as late as September (Pratt 1970, Ives 1972). At high elevations, breeding phenology may be delayed a month, or more. Reportedly breeds first at 2yr. Niche: In California, often nests in mixed colonies with great egrets. Old nests sometimes reused by great horned owls, long-eared owls, and other birds. In a Placer Co. breeding colony, the only avian predator apparently was the goiden eagle; other large raptors and corvids were ignored (Wilburn 1971). Sensitive to human disturbance near nests, and probably to pesticides and herbicides in nesting and foraging areas (Jackman and Scott 1975). Populations in California increased between 1970 and 1978 (Belluomini 1978). Belluomini, L. A. 1978. Statewide heron rookery study. Calif. Dep. Fish and Game, Sacramento. Nongame Wildl. Invest. Job IV-1.0. Prog. Rep. 10pp. Cogswell, H. L. 1977. Water birds of California. Univ. California Press, Berkeley. 399pp. Cottrille, W. P., and B. P. Cottrille. 1958. Great blue heron: behavior at the nest. Univ. Mich. Mus. Zool. Publ. No. 102. 15pp. Gould, G. I., Jr. 1974. Breeding success of piscivorous birds at Eagle Lake, California. M.S. Thesis, Humboldt State Univ., Arcata. 94pp. Ives, J. H. 1972. Common egret and great blue heron nest study, Indian Island, Humboldt County, California. Calif. Dep. Fish and Game, Sacramento. Wildl. Manage. Branch adm. Rep. No. 72-9. 41pp. Jackman, S. M., and J. M. Scott. 1975. Literature review of twenty three selected forest birds of the Pacific Northwest. U.S. Dep. Agric., For. Serv., Reg. 6, Portland, OR. 382pp. Krebs, J. R. 1974. Colonial nesting and social feeding as strategies for exploiting food resources in the great blue heron (Ardea herodias). Behavior 51:99-134. Kushlan, J. A. 1976b. Wading bird predation in a seasonally fluctuating pond. Auk 93:464- 476. Mallette, R. D. 1972. Statewide heron rookery study. Calif. Dep. Fish and Game, Sacramento. Special Wild. Invest. Job III-5. 8pp. Mock, D. W. 1976. Pair formation displays of the great blue heron. Wilson Bull. 88:185-230. Palmer, R. S., ed. 1962. Handbook of North American birds. Vol. 1. Yale University Press, New Haven, CT. 567pp. Pratt, H. M. 1970. Breeding biology of great blue herons and common egrets in central California. Condor 72:407-416. Wilburn, J. W. 1971. Lincoln great blue heron rookery study, 1970-971. Calif. Dep. Fish and Game, Sacramento. Special Wildl. Invest. 17pp.